RayShelf is a revolutionary shelving system designed by Italian Architect, Matteo Gerbi. The design introduces a sense of duality to wall mounted furniture by functioning as both a practical bookshelf and a work of art. The concept is simple, take two or more lightweight metal bars, insertthem between various brightly coloured steel shapes and create a bespoke shelving system. The primary feature of this design is to allow users the freedom to arrange the various components in a fashion that suits their own requirements. Ray Shelf has been designed and conceived as an art installation based on the visual representation of light rays that pass through its surface to linkthe colourful geometric supports together. The result is a kaleidoscopic structure, suitable for use in the home or as a workspace feature, which offers an innovative solution to the need for visually stimulating storage units. 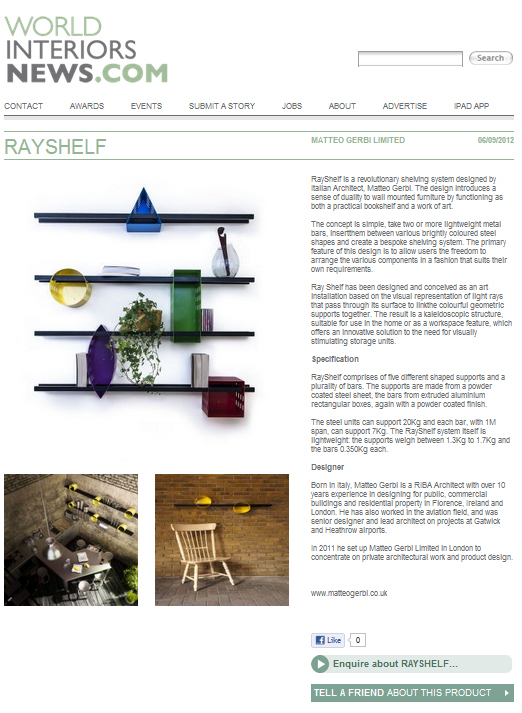 RayShelf comprises of five different shaped supports and a plurality of bars. The supports are made from a powder coated steel sheet, the bars from extruded aluminium rectangular boxes, again with a powder coated finish. The steel units can support 20Kg and each bar, with 1M span, can support 7Kg. The RayShelf system itself is lightweight: the supports weigh between 1.3Kg to 1.7Kg and the bars 0.350Kg each. Born in Italy, Matteo Gerbi is a RIBA Architect with over 10 years experience in designing for public, commercial buildings and residential property in Florence, Ireland and London. He has also worked in the aviation field, and was senior designer and lead architect on projects at Gatwick and Heathrow airports. In 2011 he set up Matteo Gerbi Limited in London to concentrate on private architectural work and product design.